Do you want to know your unborn baby’s blood group? Our blood type calculator can help you discover it! A baby’s probable blood group is mainly determined by the mother and the father’s genes (1). While knowing the exact blood group of the unborn baby is not possible, this tool gives you a list of the blood types that baby likely to have. Select the mother’s and the father’s blood type and you can find out the probable blood group of your child. Blood groups were discovered in the 20th century when Karl Landsteiner observed that the red blood cells (RBCs) had specific substances on their surfaces, which were later used to create blood types. The two important blood group classifications in humans are the ABO and the Rh systems. The ABO system has four major blood groups – A, B, AB, and O. Blood type A has the antigen A, blood type B has the B antigen, and O has no antigen on its surface (2). Each of these groups is either Rh positive (D) or Rh negative, which means there are eight major blood groups in all. Knowledge of both these systems is essential for medical reasons, especially blood transfusions. The gene, ABO, determines this blood group system. The four blood groups – A, B, AB, and O develop when the child inherits one or more of the alleles – A, B or O. The alleles A and B are considered codominant while O is considered to be the silent allele. Each parent gives one of their two ABO alleles to the child (3). Mother with AB blood type can either pass the A or B allele to the baby. Likewise, a father with O blood type can only pass O allele to the baby. If both parents belong to the blood group O, the child will also belong to the O blood group. Two A blood group parents can give their child either A or O blood group. Two B blood group parents can give their child either B or O blood group. One parent with A and another with B will give their child either A, B, AB or O groups. One parent with A and another with AB will give their child either A, B or AB groups. One parent with A and another with O will give their child either A or O blood group. It is second most popular and also one of the complex blood types discovered by Landsteiner and Weiner in 1940. The research with rhesus monkeys on human blood led to the Rh factor, which can be either positive (+) or negative (-). With this blood grouping system, eight blood types were formed. The Rh positive (Rh+) genotype masks the Rh negative (Rh-) gene. So even if you have an Rh+ blood type, you could possess an Rh- gene. Also, when both parents have the Rh+ gene, it is possible for the child to have Rh- blood type(4). While blood groups are 100% genetically inherited, the environmental influences determine which groups are passed on more frequently to the next generations. According to the American Red Cross, B(-), AB(-) and O(-) are the rarest blood types and each account for less than 5% of global population. 1. Can a child have different blood type than both parents ? 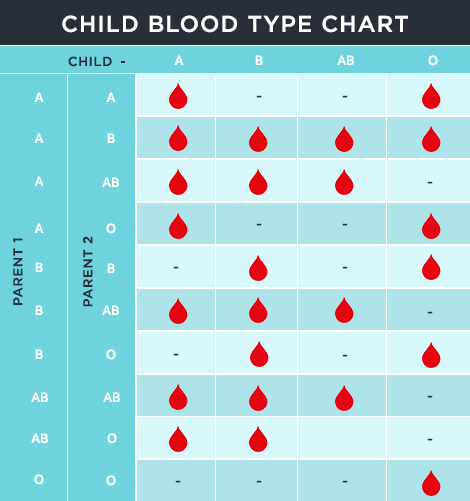 Yes, the child can have a blood type different from its parents. For instance, parents with blood types AB and O can give their children either A or B blood types, which are different from the parents’ blood groups. 2. Which parent determines the blood type of the child? The blood type of a child depends on the blood type of both the parents. Each biological parent donates one of their two alleles to make up the child’s blood group. So the child’s blood type depends on the alleles that the parents carry(5). For instance, if the mother has the blood type AO and father has blood type BO, the child can end up with any one of the blood groups: A (25%), B (25%), AB (25%) or O (50%). 3. What is the rarest blood type ? AB negative is the rarest blood type according to the American Red Cross. It is found in 1% Caucasians. It is even rarer in African Americans. B negative and O negative are also rare blood types which are found in less than 5% of total world’s population (6). Disclaimer: The child blood type calculator is based on theoretical principles. The information should not be used to make any conclusions about your family’s blood grouping. There is a chance that the blood type calculated here and the actual blood type of the baby are not the same. Therefore, we recommend that you check the baby’s blood type with a healthcare provider as well, instead of relying only on the calculator for determining blood type inheritance.